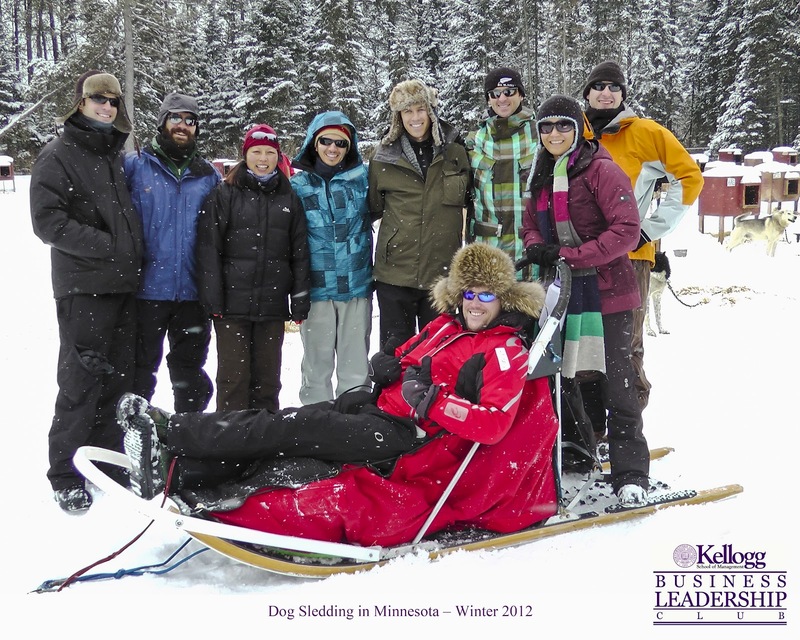 The Southern Terrain recently completed a winter leadership program into the Boundary Waters of Northern Minnesota. The group consisted of several MBA students from Kellogg School of Management. 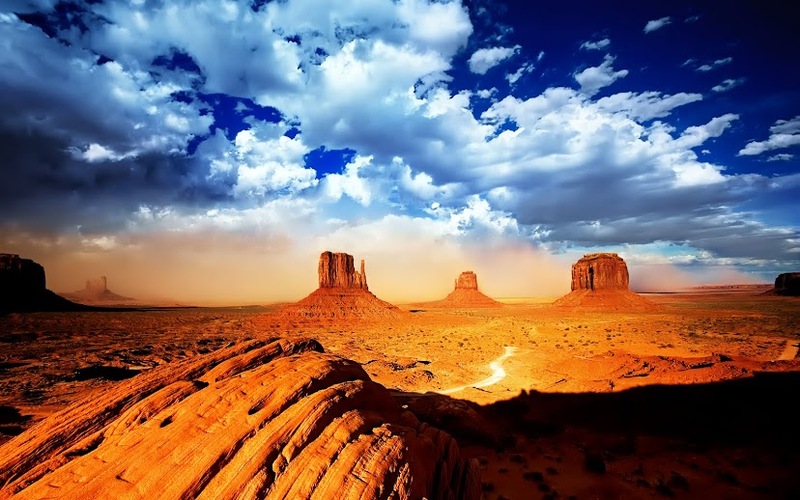 The program was staged out of Ely, Minnesota on the border of the most visited wilderness area in the entire United States. The group arrived late Friday night and shuttled to the cabins on the shores of Gegoka Lake, MN. The following morning we had a program brief and a gear review session prior to departing for the kennel. We feasted on a large breakfast consisting of french toast, fresh fruit, muffins, bagels, eggs and hash browns to ensure we properly fueled for the upcoming adventure. We arrived at the kennel to the sounds of over 100 dogs getting excited for their journey. Each dog an Alaskan Husky, not a bread of dog by rather a type type best known for dog sledding racing and speed competitions. 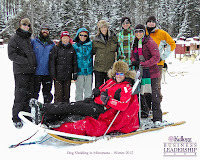 We donned our insulated boots, received a instructions from our champion dog sled racing leader, and harnessed up the team. We put the lead dogs on first followed by the team dogs and finally the wheel dogs in the back. The dogs each had a very distinct personality and they knew what their roles were on the team. As we packed up our sleds the roar of the dogs created a buzz in the yard in anticipation of getting on the trail. With a load "alright" our dogs charged own the trail pulling our sled at maximum speeds. We navigated through the forests and into open swap areas that had been frozen over for the season. The fresh snow pack provided a nice cushion for the dogs allowing the sled to glide over small roots and trees. We continued through the single track trails stopping with the occasional "whoa" to give the dogs a well deserved rest. We concluded the day on a frozen lake where the group worked together to prepare camp, tend to the dogs, cook amazing tortillas, and build a fire on the ice. The camp was set up with nice tents but the overall consensus was to sleep out underneath the stars. It was a long 22 mile day on the trail but warm beverages and hot dinner made it easier to sink into our bags for the evening. The following morning we proceeded to work together to break down camp, and with one leader directing the effort the camp camp down quickly. We left and led our team of dogs at a frenzied pace through the trees with numerous "haw's" and "gee's". The snow was coming down in blizzard conditions and we made it back to base in time for hot soup and scones. The team said goodbye to the dogs and drove through the elements to get to the airport on time. This unique experience created a significant amount of group cohesion, camaraderie, and opportunities for everyone to experience something outside their comfort zones. Stayed tuned for our next adventure update. The lure of fresh powder and the chance to avoid the crowds makes backcountry skiing and boarding an ideal way to create that picture perfect day. 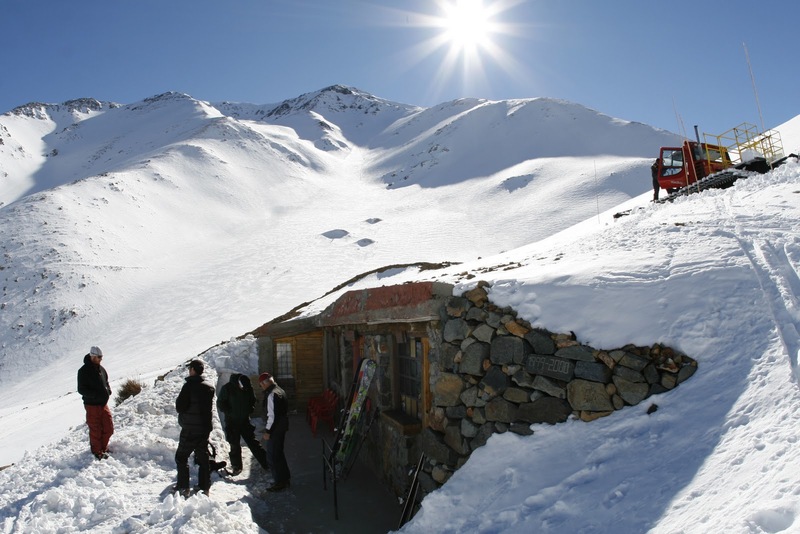 On a recent trip to the Chilean Andes with The Southern Terrain we had the amazing opportunity to snow cat ski some of the most remote regions of the country and experience snow similar to what you would expect in Valdez, Alaska. However, with ideal conditions comes the danger of backcountry exploration. Thankfully, our team was prepared and prudent with our situation and we enjoyed possibly the greatest day of powder anyone has ever had. While our experience was surreal, all too often the results of backcountry exploration end in unfortunate situations. Each year, avalanches claim more than 150 lives worldwide, and thousands more are caught in avalanches partly buried or injured. With the amount of snow fall we’ve had so early in the season the avalanche danger, particularly in the Eastern Sierras, can be high so please consider these important safety precautions and instructions when entering into avalanche prone areas. Particularly, how to test for avalanche conditions, what to do if you are caught in an avalanche as well as proper rescue techniques. There are numerous ways to gauge the stability of the snowpack without technical equipment. Firstly, watch for any cracks jetting across the surface or small slabs shearing off. Also, listen for "hollow" or "thumping" noises as you walk or ski across the surface. This indicates that there is a weaker layer underneath, leaving the surface layer prone to collapse. More reliable measurements, such as snow pits and shear tests, will help you predict more accurately how stable or unstable the snowpack is. 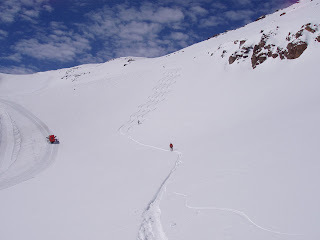 The most effective snowpits should be dug near potential avalanche starting zones, but without putting you or other members of your party at risk. With a shovel, dig a hole four to five feet deep and approximately three feet wide. Smooth the uphill wall until it is vertical and you can see the different layers of snow. By pressing your hand against each layer to feel its hardness, you can determine whether there are weak layers. From the vertical, uphill wall of the snowpit, separate a column of snow without pulling it free from the wall. Insert a shovel at the back, uphill side, of the column and gently pull on the handle. If weak layers pull loose quite easily, the snowpack is very unstable. If it takes a few tugs on the handle before any layers pull loose, the snowpack is slightly unstable. When conducting these tests throughout the day, pay attention to the slope angle. 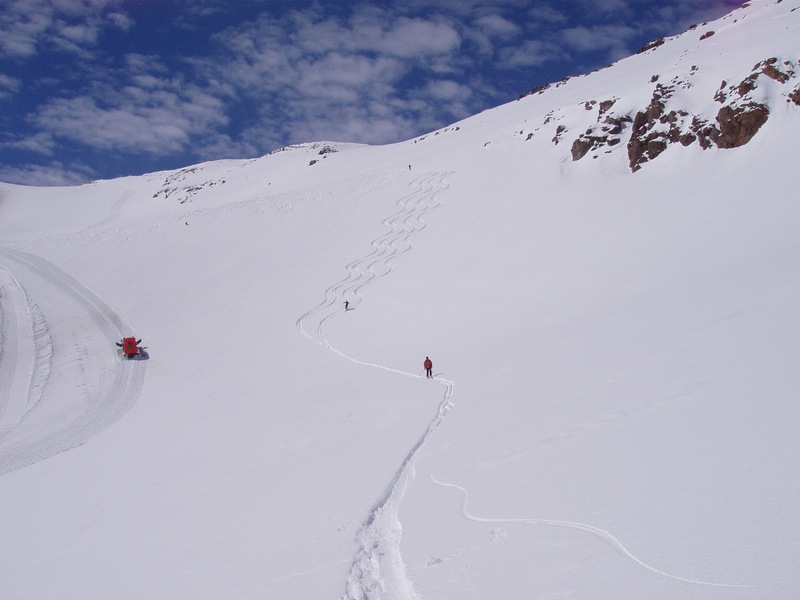 Most avalanches occur on slopes between 30 and 45 degrees, but can occur on any slope angles given the right conditions. You can measure the slope angle with an inclinometer, or you can "eyeball" it by dangling a ski pole by the strap and estimating the angle. Layers that seem strong on a 30-degree slope may be much weaker on a steeper slope. Also, remember that the shear test relies on the pull of a shovel, not the weight of a person. You can test this by standing or jumping on the uphill edge of the snowpit, but only if you already know the snowpack is stable after conducting a shear test. When you realize you are caught in a slide yell and try to let go of ski poles and get out of your pack to make yourself lighter. Use "swimming" motions, driving upward to try to stay near the surface of the snow. When an avalanche comes to a stop the snow can set, and become as hard as cement, and unless you are on the surface, it is almost impossible to dig yourself out. If you are fortunate enough to end up near the surface, try to stick out an arm or a leg so that rescuers can find you quickly. If you are buried over your head, try to maintain an air pocket in front of your face by punching the snow with your hands and arms. Many avalanche deaths are caused by suffocation, so creating an air space is one of the most critical things you can do. When an avalanche finally stops, you may have only a few seconds before the snow sets and hardens, and it is important to hold your breath before hand as you may not be able to breathe after the snow compacts around you. Above all, do not panic. Keeping your breathing steady will help preserve your air space and extend your survival chances. If you remain calm, your body will be better able to conserve energy. If your partner, or someone you see gets caught in a slide, try to watch the victim as they are carried down the slope, paying particular attention to the point at which you last saw them. After the avalanche appears to have finished and settled, wait a minute or two and observe the slope carefully to make sure there is no further avalanche danger. If some danger does still exist, post one member of your party in a safe location away from the avalanche path to alert you if another avalanche falls. Begin looking for clues on the surface beginning with the point where they were last seen. 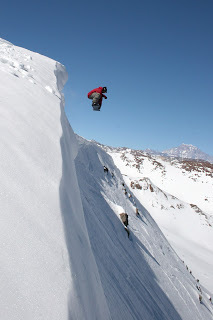 As you move down the slope, kick over any large chunks of snow that may reveal clues. Since equipment and items of clothing may have been pulled away from a victim during an avalanche, they may not indicate their exact location, but can help determine the direction the avalanche carried them. Mark these spots as you come across them. Once the victim is found, it is critical to unbury them as quickly as possible. Survival chances decrease rapidly depending on how long a victim remains buried. Treat them for any injuries, shock, or hypothermia if necessary. For those using probes, begin at the point the victim was last seen at, and stand in a straight line across the slope, standing shoulder to shoulder. Repeatedly insert the probes as you move down slope in a line. Pay particular attention to shallow depressions in the slope and the uphill sides of rocks and trees, since these are terrain traps where they may have been buried. When venturing into the backcountry be sure to have all the necessary equipment, check the local weather report, and notify the authorities of where you will be going. Above all be safe and enjoy the places you’ve worked so hard to get to. Are there any signs of excessive wind loading on the slopes? What have the weather conditions been like the past few days? Any large snow falls? 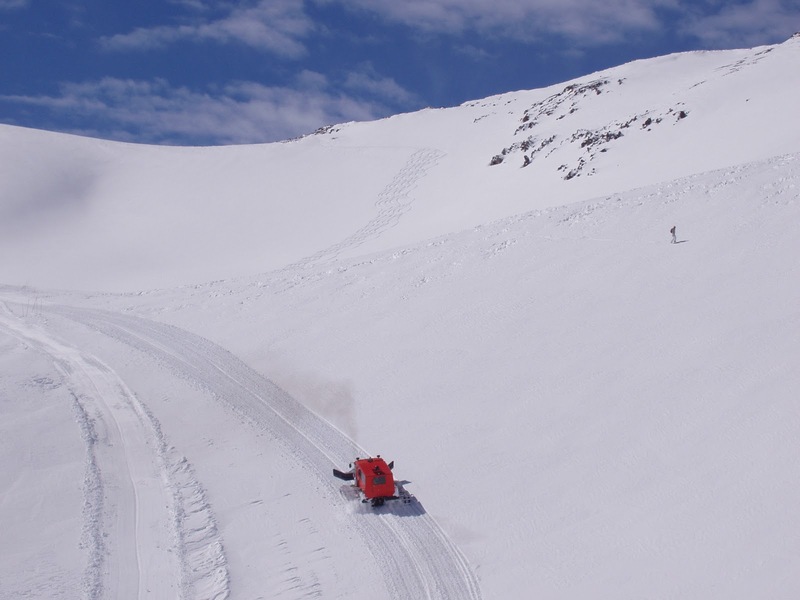 Do you have a good sense of the snow pack and have you done any snow pit or shear tests? Have you noticed many fracture lines, heard "thumping" or cracking sounds, or hollow noises in the snowpack? Are you keeping an eye on the orientation and steepness of the slopes as you cross them?